1) Cut chicken into bite sized pieces. 2) Soak the cashews in warm water for 30 minutes and blend them till you get a smooth paste. 3) Blend tomatoes, green chillies, ginger garlic paste and cumin powder together till it is smooth. Sieve the mix if needed. 4) Add the chicken pieces, food color and salt to the blended tomato mix and cook till the chicken is almost done. 5) Remove the chicken pieces and grill or fry them with a little butter. Do not skip this step as it enhances the taste. 6) Melt butter in a vessel and add garam masala powder, red chilli powder, the cooked tomato masala, ketchup and yoghurt. Cook until the oil rises to the surface. 7) Add the cashew paste, lemon juice, sugar, grated cheese and the chicken pieces to the prepared gravy. 8) The texture should be creamy and smooth. 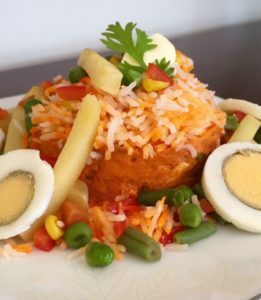 9) Add the fried mixed vegetables, french fries, fried capsicum and whole eggs to the chicken masala making sure you leave a little of each aside for garnishing. 10) Soak rice for an hour. Cook the soaked rice in water that is seasoned with salt, a little oil and brought to a boil. 11) Once the boiled rice is almost done, drain the leftover water and add some melted butter to the rice. 12) Layer the rice over the prepared chicken mixture. 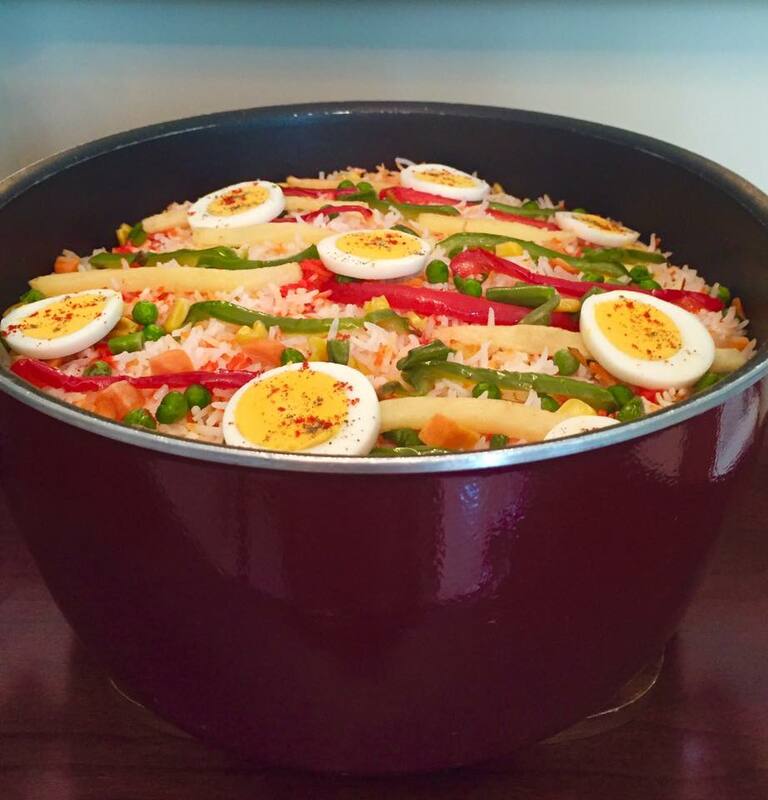 13) Sprinkle some food color over the rice and garnish with the remaining french fries, sliced boiled eggs, sautéed capsicum and mixed vegetables.